Ester Henning was an artist who created powerfully expressive images, sculptures and embroideries. Her unusual life experiences and artistry became the subject of the first ever doctoral dissertation on a female Swedish artist, completed in 1989. Ester Henning was brought up in the home of a poor cobbler in Värmland. She was the fourth daughter in a family of seven sisters and one brother. After four years of schooling, at the age of twelve, she began to work as a nanny in Mora. This was also the home of the great artist Anders Zorn and this coincidence led to the baseless myth that Zorn “discovered” her, taught her and advised her to focus on sculpting. It was in fact the Dalarna painter Isidor Jonsson and the landscape painter Enoch Ringnér who mentored her. In 1911 she made her way to Stockholm and enrolled at the technical college for female apprentices. Her attendance there was sporadic due to the demands placed on her to earn her keep. She worked odd jobs as a maid, a seamstress, a vending machine washer, and by selling wooden ornaments, but she never stayed long in one job. During the four academic terms that she took courses in life and ornamental modelling she only attended for brief and intensive periods, presumably when she did not have paid work. 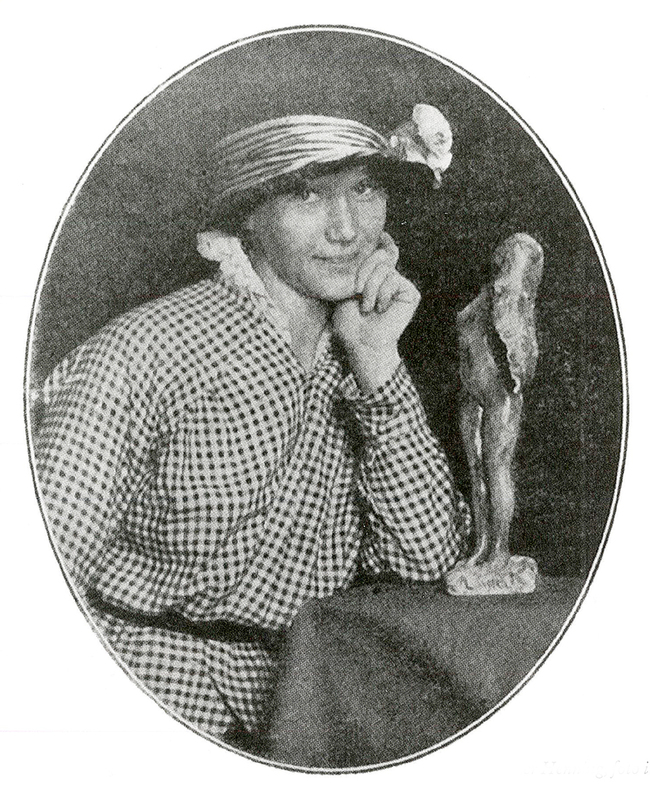 In 1916 she was noted in an article in the journal Idun, “Från automatdiskerska till skulptris. Ester Henning och hennes konst” (“From machine washer to sculptor. Ester Henning and her artwork”). The journalist Harald Heyman described how she was beginning to become known as an artist, had sold a couple of statuettes and had had two sculptures cast in bronze, namely Näckrosen and Svärdsliljan. At this time postcards were available with images of her statuettes. However, Ester Henning complained of being strapped for cash and hungry and her physical difficulties led to a psychological breakdown that same year. She had begun to believe that she was being followed, had gotten into fights with the police and then been taken to Katarina mental hospital. After a couple of weeks of medical observation she was diagnosed as schizophrenic but still released as “healthy”. In 1919 she was admitted to Säter hospital and subsequently remained under mental health care until her death. During the years 1927-1930 she was admitted to Uppsala hospital and asylum, and then transferred to Långbro hospital. In 1932 she was placed at Beckomberga, a newly-built massive hospital for 1600 patients. Ester Henning was registered in a section for “the slow and untidy”, but after two years she was transferred to “tjugotvåan kvinns” (the women’s 22nd), a slightly disorderly section for chronic patients, which came to be her home for 40 years. She was a mute who could not be communicated with until Janny-Lisa Clason, the first counsellor at the mental hospital, gave her paints and crewel. Her medical annotations from 1941 state there was a “notable improvement” since she started painting several paintings every day. In 1946 an exhibition of 58 colour paintings called “Schizofren konst” (“Schizophrenic Art”) was held in Gothenburg alongside works by Carl Fredrik Hill and Ernst Josephson. The critics were astounded by Ester Henning’s “unbelievably realistic powers of observation” and placed her in “the same category as van Gogh, whose relationship with reality was never radically changed by illness”. Although her artwork was seen as true to life, she herself was described as “severely mentally ill, incapable of communication”, according to the medical notes which gave rise to the declaration of her incapacity in April 1946. Eric Linblad was appointed as her legal guardian and he came to support Ester Henning’s artistry. He organised several exhibitions of her works and ensured that she had a media profile. In 1963 a retrospective exhibition was held in the Beckomberga hospital events hall entitled “Ester Henning. Tavlor – skulpturer genom fyrtio år” (“Ester Henning. 40 years of paintings and sculptures”). The largest ever exhibition of Ester Henning’s work took place in 1970 when Svenska konstnärinnors förening (the Swedish female artists’ association) had a celebratory display at the Liljevalch gallery in Stockholm, entitled “Kvinnliga konstnärer 1910-1970” (“Female Artists 1910-1970”). Ester was specifically invited to participate and 175 pieces of her work were submitted. At this time she was in the middle of her last productive creative period. In 1969 she had been offered a place at a private rest home in Flen where, for the first time in her life, she had her own private room. A fourth of her surviving artwork dates from the three years she spent at Flen. In 1973 she was returned to “tjugotvåan” at Beckomberga and then in 1978 she moved to her last address, the long-term care section of Solberga hospital. Ester Henning’s entire artistic output comprising more than 1000 pieces must be seen in the light of the limitations of institutionalised life. She spent 15 years locked in one pavilion with one view of the Beckomberga surroundings. This is her most common theme and occurs in hundreds of variations: sometimes she would move buildings around, or paint them in different sizes or colours. In a similarly stubborn fashion she portrayed the machinist’s cottage in the hospital park, when she had finally been given the freedom to move around after 28 years of being locked inside. She painted it with watercolours and in oil, she drew it with coloured crayons and she embroidered it. The house was sometimes depicted as grey, weather- and wind-worn, and sometimes shown as yellow or pink. Her output from the 1940s included several impressions of her memories of Säter and Dalarna, both in terms of landscape and animal portrayals. The hornless, knobby hill cows and the birds of the regions are depicted as surprisingly round and well-fed. She never drew interiors of the hospitals she was in, but rather produced many images of flowers in the ever-present hospital vases. A flower arrangement in the day room was sometimes the only visible manifestation of life beyond the hospital walls. When she had no model to paint from she created her own floral still-life in her mind. These sometimes included flowers which would not naturally bloom at the same time or could not be placed within any particular botanical category. These types of flowers tended to appear in her embroidery. However, when she regained an element of freedom these fantastical arrangements disappeared. In the 1950s she spent a lot of time picking flowers and when she painted flowers outdoors she would place them in a vase or a jug. She had become unfamiliar with seeing them in their natural surroundings. It was also during the 1950s that she was able to return to sculpting as part of her art therapy. A large part of Ester Henning’s artistry comprises fellow patients. She drew in secret and imbued the drawings with her own feelings. The models tended to be exaggeratedly red-cheeked and smiling or grimacing threateningly, as in Porträtt av Sigrid Hjertén på sjukhuset from 1941. Her magical expressionism enabled her to create a secret gallery of people, which served as a substitute for genuine human contact. She was forced to invent strategies for self-expression as a result of hospitalisation not of her diagnosis and this had a consequential impact on her artistry. Ester Henning’s life has inspired many authors and artists. Pia Naurin wrote a monologue entitled Den förskruvade in 1997 based on Ester Henning’s life. Maud Nycander and Kersti Grunditz’s film, Konstnärinnan på avd. 22, which premiered at the 2009 Gothenburg film festival and was later broadcast as a K-Special on TV2, is also based on Ester Henning’s life. Åsa Dahllöf wrote a poem about her called “Barkbitar” in Segel. Sju poeter från Uppsala, 1991, while Ulva Ugerup used Ester Henning’s face and name in her embroidery and textile application work. In 2013 Petra Johansson, Neta Norrmo and Helena Persson created a projected sound and light artwork as a permanent installation at Skövde Art Museum. Further, in 2015 Bonniers publishers released Anna Jörgensdotter’s poetic fantasy novel Drömmen om Ester. Ester Henning died in Stockholm in 1985. Ester Matilda Henning, www.skbl.se/sv/artikel/EsterHenning, Svenskt kvinnobiografiskt lexikon (article by Irja Bergström), retrieved 2019-04-26.